hmmm..Pringles. How you tempt me with your light and crispy ways. Now you had to go and make “Tangy Buffalo Wing” and I am hooked. They have that simple cayenne pepper flavoring that makes wings soooo addictive…..as are these snack crisps. 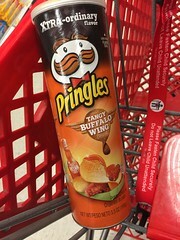 I found them at Target and might just be my new favorite Pringle. Which is your favorite Pringle flavor? ?